I’d rather not spoil anything. I’d rather you figure out everything in The Witness yourself. But if you need some general advice, here goes. If you try a puzzle and get the solution wrong, the line you drew will fade away. You’ll want to try again, but can you remember what you just did? Make your life a little easier by taking photos (or screenshots) of failed attempts, so that you don’t waste time repeating them. There might also be other instances where taking a still image would be helpful. Just saying. You can use a controller stick or the d-pad to draw lines through the game’s grid puzzles. The stick is fine, but the cursor it controls can be a little slippery. Using the d-pad gives your more control and fewer risks that you’ll accidentally draw your line down the wrong path. What are the variables for a given puzzle? What would happen if you suddenly changed or tweaked one? Each step of a puzzle almost always tweaks one variable, sometimes dramatically and with no warning, so being systematic in your approach can really help. Your goal for solving a puzzle usually involves drawing a contiguous line. Because of that, it will help to figure out where any of the parts of your line should go. If you don’t know where to start your line or which way to make your line go from the starting point, you could start figuring out some middle section. What often works even better is starting at the end and working backwards. You might need that notebook to help you with this. Look Around After Finishing A Puzzle. See Any Wires? Sometimes, though, you may get the sense that something more should have happened. Well, look around. Did the puzzle you solve have a wire going out of it? Is that wire illuminated? It must connect to something. Hell, do you see other dark wires on the island? You should try lighting any and all of them up. The game isn’t going to give you power-ups for solving its puzzles. As I said in my review, knowledge is the game’s collectible. If you see a row of puzzles, they’re there to teach you one of the many rules that govern the island’s puzzles. The only reward you’ll be getting for finishing them is the knowledge of how to clear other puzzles that use those rules. In this game, that’s reward enough. Wondering how you’re doing? There aren’t many progress markers in the game, but you can see how many puzzles you’ve solved by pausing the game and going to the “load a saved game” menu. At least on PS4, that’ll show you how many puzzles you’ve solved. Also, note that the game is auto-saving regularly. Wander around the island. Do this early, and do it often. There are lots of memorable landmarks, some of which you’ll eventually approach from many angles. Remember them! Areas that didn’t seem approachable or puzzles that seemed unsolvable will probably look differently when you wander upon them again. Anything that looks odd to you is worth exploring. Anything that looks like it might be a puzzle probably is. Take your time, poke around and go back to places you’ve been to, even if you’re sure you did all the puzzles there. 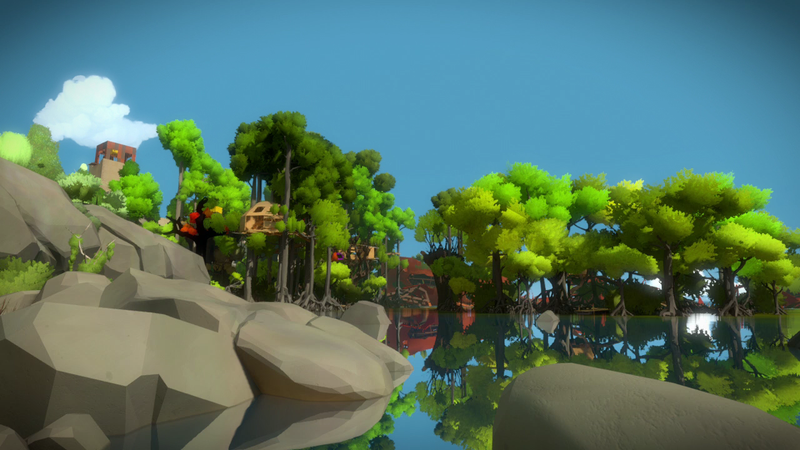 The Witness is full of hidden puzzles. It’s fun to find them, so keep looking. There’s a good chance that you’ll encounter puzzles with starburst symbols on them before you’re able to solve them. Don’t worry. This is the game’s way of telling you you’re not ready. Trust that there are puzzles elsewhere on the island that will explain that and any other foreign symbol to you. What you’re looking for are rows of puzzles, rows that start simply. Those rows are what the game uses to teach each symbol. Keep exploring and you’ll find the one for the starbursts and for other stuff, too. Once you figure out what the rules are, I recommend jotting them down in a notebook. Expect that there will be at least one twist to the puzzles in the game’s rows of teaching puzzles. Remain nimble in your thinking so you can solve it. The designers are tempting you to become rigid, to keep applying the same approach. Get around that. There are a small number of puzzles in the game, 10 or so as best we can tell, that will be unsolvable if you are hearing-impaired. There are also some cool but optional ones that may confound you if you are colorblind. See here for more details. Keeping this as spoiler-light as possible, be aware that the end sequence of the game will lead you to a screen that puts you back to the beginning of the game with zero puzzles solved. Don’t worry! The game auto-saves a few puzzles before you reach that sequence, so you will be able to go back and solve more puzzles if you’d like. If you finished all or most of the puzzles on your first time through, then, well, wow. This tip doesn’t apply to you, and you might be a genius. Starting the game fresh is very rewarding. Yes, you’ll have to do some tough puzzles all over again (you took photos of the solutions to the trickiest ones, right? ), but you will also likely see a LOT of puzzles you missed the first time through. You could just keep plumbing your first playthrough, but there’s something great about starting the game from scratch with experienced eyes that is impossible not to recommend. There is a cool Easter Egg that you seemingly can only access when you’re initially in the game’s starting area. This is an Easter Egg you probably wouldn’t know how to get in your first playthrough. No hints on what it is or how to get it other than this: if you have opened the gate in the starting area without experiencing the game’s credits, you missed it and should restart. If you found it, you’ll be able to then load a save that puts you back a step but registers that you made that discovery. Still Stumped On A Puzzle? Maybe Draft An Email To Jonathan Blow (But Don’t Send It). If you reach a puzzle that doesn’t contain any new symbols that you don’t know, you can solve it. Just think about it. Maybe use that notebook or that camera. If none of that is working, consider writing an e-mail to the people who made the game. You probably don’t have their email address, but that’s okay—it’s the act of writing it that counts. I did that three times while I was playing the game, each time worried that I’d reached a puzzle I wasn’t supposed to solve yet. I was wrong all three times, but I found that simply organizing my thoughts in an e-mail helped. I’d start writing to the game’s lead designer, Jonathan Blow, confidently explaining how I understood the rules in his game and walking him through why the puzzle I was staring at didn’t seem to be obey those rules and ... then I’d spot the hole in my logic. I didn’t even need to send the e-mails, because simply drafting them was enough to sort my thinking out. I did send one e-mail, but I figured out the answer the moment I hit send. So, yeah, draft ‘em, don’t send ‘em. You can figure this stuff out yourself!